The Mississippi River towns are comely, clean, well built, and pleasing to the eye, and cheering to the spirit. The Mississippi Valley is as reposeful as a dreamland, nothing worldly about it . . .nothing to hang a fret or a worry upon. This is the most well known image of a moving panorama. 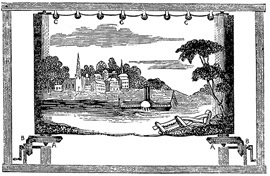 This illustration appeared in the article "John Banvard and His Panorama." It appeared in Scientific American magazine in 1848. In the 19th century, there were seven different moving panoramas of the Mississippi River. This webpage looks at three of them plus one 21st century EPIC recreation. Finally, we will look at a pocket-sized, hand-cranked ribbon map of the Mississippi River. Enjoy! John Banvard, one of the most successful moving panorama showman of the 19th Century. 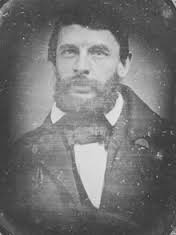 John Banvard (1815-1891) was one of the most successful moving panorama showman of the 19th century. A self-taught artist, he spent two years sketching the Mississippi river before painting the moving panorama. Unfortunately, the painting did not survive. It was described as being a bit "rough" or "folk artish" but the size of it (advertised as three miles long) together with his masterful story telling made the show a instant success. Banvard performing his Mississippi moving panorama for Queen Victoria. In 1848, Banvard crossed the Atlantic to take his moving panorama to London where he opened at the Egyptian Hall. With the combination of his Yankee delivery, joke telling and artwork, he was able to "transport" the audience across the waters to the Mississippi. 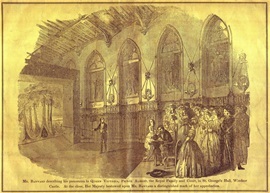 The show was so successful he was invited to perform for Queen Victoria at Windsor Castle. His immense fame inspired others to follow suit. At one time there were seven touring Mississippi panoramas. Only one survived to this day. Known as the "Dickinson/Egan" panorama which is shown below. Banvard wrote a book about his two year sketching trip down the Mississippi along with descriptions of the moving panorama scenes. 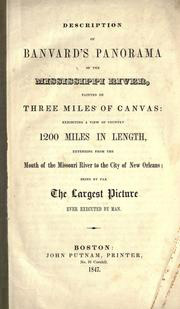 You can read the book at the following link entitled (get ready) Description of Banvard's Panorama of the Mississippi River Painted on Three Miles of Canvas Exhibiting a View of Country 1200 Miles in Length, Extending from the Mouth of the Missouri River to the City of New Orleans; Being by Far the Largest Picture Ever Executed by Man. 1847. 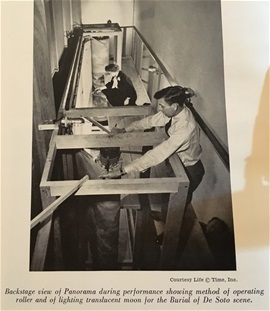 The original Dickeson-Egan moving panorama was last cranked in the 1950s. The only surviving mechanism parts were one roller and some spokes. The rest had to be recreated. You can see the man is turning the scroll by moving the spokes. Image used with permission. The Panorama of the Monumental Grandeur of the Mississippi Valley was painted by John Egan around 1850. He used distemper on cotton muslin and it measures 90 in. x 348 ft. The moving panorama was commissioned by the amateur archaeologist Wilson Dickeson (1810–1882). It is the only surviving panorama of the Mississippi River. The scroll is made up of twenty-five scenes that interpret the history of the River Valley. It differs from the other Mississippi panoramas in that its focus is more archaeological in nature, with depictions of ancient Native American burial mounds. Egan sought to keep the audience's attention by portraying a wide range of weather conditions—including storms, snow, a tornado, and a rainbow—which he executed with dramatic lighting effects. It is housed at the St. Louis Art Museum. They have restored and filmed the panorama. See video below! The moving panorama is housed at the St. Louis Art Museum who restored and filmed the scroll. In 2014, portion of the panorama was on view at the Amon Carter Museum of American Art in Fort Worth, Texas . The timelapse video shows the crew loading the scroll into the giant apparatus. It makes me wonder how they managed to do this in the mid 19th Century. New-Orleans, Louisiana. Lithograph based on a scene from Lewis's moving panorama. Henry Lewis (1819–1904) was born in Kent County, England. His family emigrated to Boston in 1833, where he was apprenticed to a carpenter. At age seventeen, he moved to St. Louis, MO, where he worked as a carpenter and scenery painter at the St. Louis Theatre. Between 1846 and 1848, he sketched hundreds of scenes of the Mississippi River. He developed his sketches into a gigantic,12 feet by 1,300 feet moving panorama which he showed in the U.S. and Europe. He later moved to Germany where he published The Illustrated Mississippi: From the Falls of St. Anthony to the Gulf of Mexico. The book was published in German. You can read it or see it at this link. If you do not read German, look at the illustrations - gorgeous! 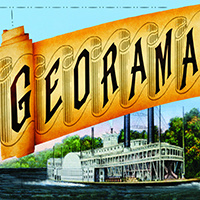 The musical GEORAMA premiered in 2016 at the St. Louis Rep in St. Louis, MO. Fast forward to the 21st Century. West Hyler and Matt Schatz created the musical GEORAMA, to celebrate the life of John Banvard, a largely-forgotten artist. It premiered in January 2016 in Banvard's home town of St. Louis. It would have been one hundred times easier to paint a small moving panorama and then digitally project it to be 8 feet high. But no! The St. Louis Rep crew painted a 600 foot long, 8 foot high moving panorama for the show. This humongous effort was lead by artist Scott C. Neal. Hats off to GEORAMA director, West Hyler and the whole crew for this major accomplishment. Where do you go to paint a 600 foot scroll? They found a skating rink in St. Louis where they could lay out the scroll on the floor to paint it. Scott C. Neale led the project. In this trailer from 2015, you can see the canvas "rolling" in the background. 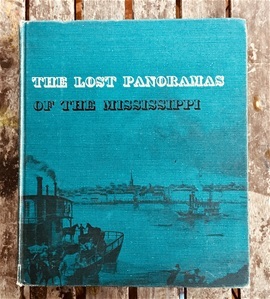 The Lost Panoramas of the Mississippi tells about all seven of the Mississippi moving panoramas. Published in 1958, it's one of my favorites. In the book THE LOST PANORAMAS OF THE MISSISSIPPI John Francis McDermott points out that there was a bit of exaggeration (to say the least) in advertising the length of the moving panorama paintings. Many panorama showman were continuously trying to outdo their competitors. McDermott points out that Banvard advertised his painting to be 3 miles long and that the show lasted one and a half hours. McDermott he did the math: "At the rate of two miles an hour, 176 feet of canvas passed before the eyes of the spectator every minute." Part of the RIBBON MAP OF THE FATHER OF WATERS. This section featured Civil War sites. Image from the Library of Congress, Public Domain. Finally, I leave you with this little gem, a "ribbon map" of the Mississippi. It was 2 inches X 11 feet, rolled up on a little spool, housed in a special case with a crank! Steamboat passengers could follow along with this little map. Coincidentally, moving panorama showman transported their huge paintings on steamboats. The miniature hand-cranked maps could have been traveling on the same boat with their moving panorama relatives! Special thanks to crankster Emmy Reichgelt for telling me about these maps. 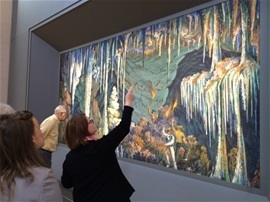 Melissa Wolfe, Curator of American Art at the St. Louis Art Museum, points out some details of the Mississippi panorama to members of the International Panorama Council, Jan. 2015. Photo by Sue Truman. Special thanks to Melissa Wolfe, Suzanne Wray, Emmy Reichgelt, West Hyler, Matt Schatz and Scott Neale who all contribulted to this page in various ways.